Textual analysis can provide insights into documents from history. Some documents serve as symbols of a generation’s views and some are representative of a larger thought pattern. Let’s shed our light on a certain part of the Israeli left. One might say this is an examination of the dialectic, the psychology, even the museum, of the Israeli left’s central views. It is also a tragic story of an imagined community that became alienated from a country it claimed to have built. Haim Oron was a leader of Israel’s Meretz party, which is politically left of the normative Labor left and much loved by Israeli academics, the old elites and some kibbutz members. 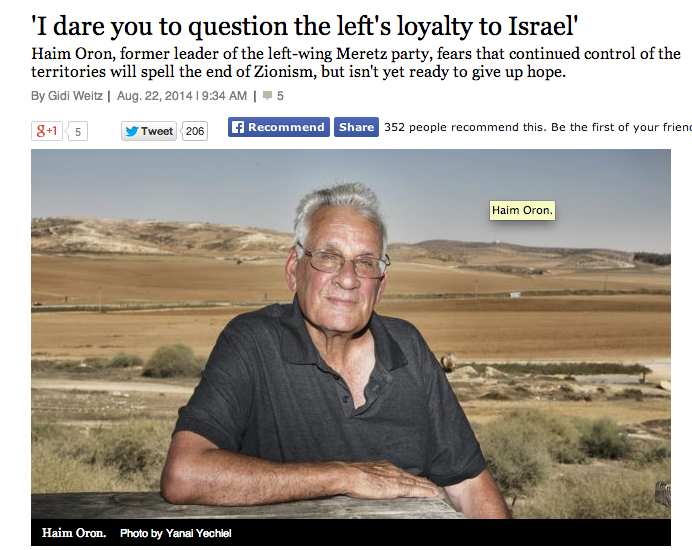 He did an interview with Gidi Weitz in the Israeli left’s newspaper, Haaretz. Let’s look at some key points raised. 2) “The next day, Oron, 74, traveled from his home of the last 52 years, on Kibbutz Lahav, north of Be’er Sheva, to defense establishment headquarters in Tel Aviv to attend a ceremony in honor of his firstborn son, Uri, a brigadier general in the air force and a combat pilot who also saw action in the war.” Oron is connected by the author to the “pioneering” kibbutz movement and his sons are said to be in the army to burnish his credentials as a real Israeli. This is similar to the Ari Shavit narrative about Jerusalem, where those who are religious or Arab or other minorities are defined as “non-Zionist,” because the self-perception of the left in Israel is that the only “real” Zionists are those from kibbutz, the “sabra” class. So while Oron claims to be called a “traitor”, in fact he is burnishing his credentials to be a Zionist “mayflower” class, as Benvenisit once referred to that generation. Part of being a member of the secular land owning kibbutz aristocracy is castigating and stereotyping the “other”, which is the right. Oron claims ““Right-wing aggressiveness has ratcheted up enormously…Some people here think they are in direct communion with God.” This characterization of the right is meant to make it seem unthinking. We will come back to this. 4) “The first time Oron’s eyes smarted from teargas was shortly after the 1967 Six-Day War, when he and others demonstrated against the nascent settlement enterprise when it set up camp in the Park Hotel in Hebron.” We see here the famous dichotomy of Israel’s competing settlement movements; the “good” settlements like his kibbutz, or those in the Golan and Jordan Valley, and the “bad” settlements in Hebron or the West Bank. 5) “I agreed with everything [Yeshayhu] Leibowitz said until he supported refusal to do military service. On one occasion, he turned to me – I was the head of the Kibbutz Artzi movement then – and said: ‘If people like you instructed 1,000 officers from your kibbutz movement not to serve, that would be the end of the occupation.’ I told him I disagreed.” Those like Oron are part of a “dialectic” of leftist thought and praxis. Israel is a small state, so most of the elites know eachother. Oron had no objection to Leibowitz’s characterization of Jews as “Judeo-Nazis”; he wouldn’t have because Albert Einstein and Hannah Arendt also called the Israeli right a “Nazi movement” and Ben-Gurion had called Jabotinsky “Vladamir Hitler.” What we see here though is the supposed “difference”, which was that he would not use his kibbutz movement to control the state’s army. This goes to the heart of the old Israeli left, which sees its institutions, such as the kibbutz, army and supreme court as its own, and to be used, just as the state is used, as a tool. It isn’t that those like Oron were citizens of a state, rather they were a movement that owned a state. Ostensibly Oron claims “My family was brought up to make the greatest possible contribution to society,” but the fact is the opposite. When the state moved on, they were left unhappy, as we shall see. 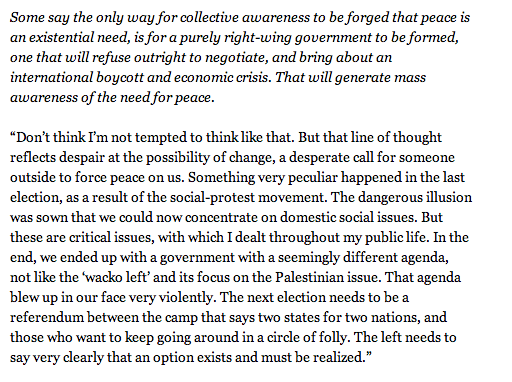 6) Barghouti and the belief in a Palestinian magic solution. “They allowed me to meet him for two years after I left the Knesset, and suddenly that possibility was blocked…Israel made a vital mistake by not finding a way to release him in one of the recent rounds [of prisoner exchanges], such as in the Shalit deal.” Many on the left worship Barghouti, Amos Oz sent him a book, and see him as a Palestinian Mandela. 7) “We want to save the Zionist project, and that necessitates terminating the occupation with an accord.” The left in Israel sees itself as the “real Zionists” who are “saving Zionism”, a sort of canary in the goldmine, Cassandra, Jeremiah the prophet, all rolled into one. A secret schadenfreude part of the Israeli left wishes the worst on Israel for an “I told you so moment.” Among eachother they admit this, but not when running for office. 9) “What you’re actually saying is, ‘Let’s start looking for passports from other countries.’ I’m not into that.” Oron, like many on the left, have an ambivalent view of the state of Israel, and the passport issue is always on their mind. He says he disagrees but as we shall see, many do not. 1) Golan begins with the Zionist origin-story, like Oron, about self-sacrifice, more stories about the Mayflower: “We, your parents, were born to a generation that voluntarily or out of necessity established this state and this society with blood, sweat and tears – in kibbutzim or moshavim, in development towns or transit camps.” She speaks to “we”, as Oron and the interviewed spoke to “us”, because part of the self-delusion of the left is not only that it is a persecuted martyred victimized minority but that when it speaks it speaks only to itself. 2) “Ultra-bourgeois”: Golan uses this term as an homage to the old left when they talked like Communists, but, as she admits, live now with villas and swimming pools, behind gated communities; the usual socialist lifestyle. 3) “Universal humanitarian values imprinted on us by our own parents, a smattering of a desire for equality and social-economic justice.” These are the talking points of self-perception and self-definition. “Universalism” is key, despite the fact that people like Oron and Golan built one of the most segregated societies in the Western world, with an incredible insularity in their acceptance-committee guarded kibbutzim. There was no “social-economic justice” in this state, but no matter, these are “values”, not obligations, like the Jewish concept of mitzvah and minhag. 4) In this passage she conveys something Oron alluded to; namely that “many” on the left in Israel have obtained foreign passports with the hope of leaving. This is a major revelation, and one that is not common to the left in any other Western democracy. The concept of leaving the country, the self-defined country “we built”, is interesting; it is self-centered, it means “we didn’t get enough, so we leave”, but it is also a very interesting mentality, the notion of alienation and that “the country was taken from us”, like it was a sort of toy. 5) “Being a leftie does not imply becoming alienated from the society you live in. That striving for peace, morality and humanism does not contradict a love for one’s country and its people.” But the very fact that she says this means that many people think this way. It means that for years there was a suspicion that having “love” for one’s country was important. 1) “My Israeliness and Jewishness are not essential to my identity.” Rejection of Judaism has been a central tenant stretching back to the early days of Left-wing Zionism. Avraham Burg, former speaker of the Knesset and head of the Jewish Agency has come out opposing circumcision; not really though because his children and grandchildren had the ritual performed; but like many on the left “challenging” is what is important, not necessarily practice. 2) “Like every cosmopolitan person, strictly secular with a universalist worldview, well-steeped in the global culture.” Alpher is negotiating his self-definition with the reader her, laying out he talking points and calling cards of the leftist club. These are the things he is supposed to say. Like Golan and Oron he is speaking to his own group, so why the need to boast? Because he thinks, as they do, the more they say this, the more it will be true; when in reality they know that they are not truly cosmopolitan or living with universalism. Often those in this club live behind a gated community and “Jewish-only” acceptance committee that would never be accepted abroad. 4) “Like any parents who believe that their children have no patriotic duty toward the Israel of today and they do not need to risk their lives or die serving it.” Here we see the classic reversal of the story told by Oron and others of “self-sacrifice.” And the idea is not to serve the “Israel of today” because of the notion that it isn’t “my Israel”, as we saw above, Israel is not owned, or a tool in his hand, like a toy, so it is not worth defending. 5) “Missiles will continue to fall on us because of settlers like him.” Part of the self-perception of this left is the idea that the “settlers”, the amorphous “other” are to blame for war and terrorism. 6) “My fate and the fate of my children will be determined here by people who have a God whom they talk to.” Compare this to Oron’s “Some people here think they are in direct communion with God.” Same sentence. It isn’t plagiarism, it is just group-think, based an assumption of what the “other”, the people who “ruined the state” are doing. 7) “They live at Yad Vashem.” One of the main myths of the left in Israel is the view that the “right” mi-uses the Holocaust and constantly invokes it to justify its mis-deeds. Avram Burg wrote part of his boook about it. 8) “I belong to a dying breed in Israel. I can’t influence the situation.” This is the same narrative of Oron, Golan and many others. The self-perception of being a threatened, albeit special and elite, species, in danger, threatened, a victim. And notice how influence is key to this. Every state has minorities, but this minority group yearns for power and control, they yearn for the old Israel they once controlled. 9) “If you identify with me you will admit that you will encourage your children to seek their future elsewhere.” Here we see that the “you and I” dialogue is clear, the assumption is many readers, which is many on the left, will agree. Golan already spoke about sending the children abroad, here were see a conscious call to do so. The irony is how this self-defined “homeland” works. He ascribes to it an ancient secular character, the “breed” or “lifestyle” he claims is normal. Of course history shows that Israel was not full of secular Jews in its long history and even in the 1950s they were not a majority. What Shavit, Alpher and others have done is describe a “threat” or “other” taking “their” country from them, when it was never theirs to begin with. Jerusalem can’t be “lost” to Arabs and religious Jews, because they were always the majority. 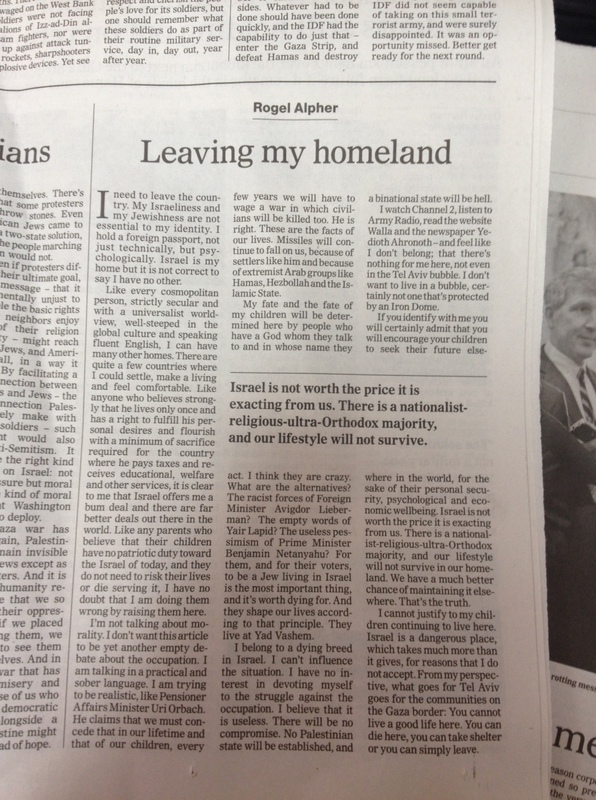 Alpher doesn’t mention Arabs because Arabs are often not even considered Israelis in this discourse, barely citizens, except in the orientalist context of being “saved.” The imagined community of “our homeland” is a specific invention of a small elite in Israel that invented an imagined secular Israel in which no one else belongs and over time as the “demographic” threat grew, this “universality” left wishes the country goodbye. The irony is that the hatred of the “other” is diametrically opposed to the universal concept these people claim to care for. For the record, the leftist/snobbish idea of abandoning one’s country because it has been taken over by lowly rightists is not unique to Israel. Over the past couple of decades, numerous famous left-wing Americans have vowed to decamp for Canada if one or another Republican candidate is elected president.